Welcome to this special Saturday publication of ESI Money. I know that many Americans are considering their healthcare choices at this time of year, so I wanted to get this out to you as soon as possible. As I noted in an earlier post, I want to offer financial solutions that I believe could benefit my readers. This is one of them. I know finding affordable health insurance is an issue for many. It remains the #1 question I get through email, even after I detailed how we handled our medical insurance in retirement. While I was at Fin Con a couple months ago, I met with the people at Medi-Share. I was familiar with the company since we almost selected them. Since that time, I’ve seen quite a few of my friends select Medi-Share as their insurance solution, so I wanted to find out more about them. The meeting went well but I was unsure whether or not to offer them as a solution since I had never worked with them. So I hired a writer, my friend, Hank, who has posted here before, to do a review. He is familiar with Medi-Share and I felt would offer better insights into the service. I know this is not for everyone. There are faith-based elements associated with this insurance alternative that make it unsuitable for some. But I also know that it will work for thousands of people reading this post. So please forgive me if this service is not suitable for you. I’m simply publishing it as an option to consider for those who might fit the criteria and want something like this. Medi-Share will be much more affordable than traditional insurance options. I detailed the numbers when we selected our insurance and Medi-Share will offer similar savings. I have talked personally with several members of Medi-Share, some who are close friends, and have not heard one bad peep about the company. To the contrary, they usually get over-the-top glowing recommendations. Health insurance is a hot topic these days especially now that open enrollment in the United States has started again. While choices for quality healthcare insurance are diminishing and costs continue to rise, more Americans are looking for ways to lessen the burden of healthcare costs. The lack of affordable options has recently made millions look at other choices such as Medi-Share to find affordable healthcare insurance. Medi-Share is a healthcare sharing membership program in which Christians share their financial resources to help pay for other members’ medical expenses. It is based on the biblical principles of Christians helping Christians and applied to healthcare expenses. For Christians, Medi-Share is an interesting option worth exploring in an effort to keep health insurance costs under control and manageable. Medi-Share isn’t health insurance but a potentially affordable alternative. And, its plans count to make you exempt from the Affordable Care Act’s individual insurance mandate. Unlike health insurance, Medi-Share is a non-profit Christian based member healthcare expense sharing program. It’s a ministry that allows its members to share in the cost of each other’s healthcare needs. Each month, members pay a monthly share similar to a healthcare insurance premium into a general fund. Then, members who have medical expenses use those funds to help pay their medical bills. It’s not health insurance. But, it is a unique replacement to health insurance coverage for many people. In fact, over 300,000 members are currently in the Medi-Share program and have shared over $2 billion dollars in medical expenses with each other. Medi-Share is a different way to do business, and the program uses different terms for insurance words, like premiums and co-pays, that we’re all very familiar with using. While Medi-Share doesn’t use the terms premiums and co-pays, they have basically the equivalent of the two insurance payments in the program. The Annual Household Portion is the amount that a household pays upfront towards their eligible medical expenses before during the year before other members can share in the cost of their medical bills. Instead of having a set insurance deductible, each household chooses their Annual Household Portion. There is a sliding scale and seven different levels for the Annual Household Portion ranging from as little as $500 for young singles to as much as $10,000 per year for families. After you reach your Annual Household Portion through eligible medical costs that you pay, Medi-Share then publishes the remaining amount of your eligible medical bills on the platform so other members can share in the cost. The standard share amount is similar to a monthly insurance premium. As you can see, the higher you set your deductible, the lower your monthly share cost is in the program. The monthly share cost includes an administrative fee each month as well. 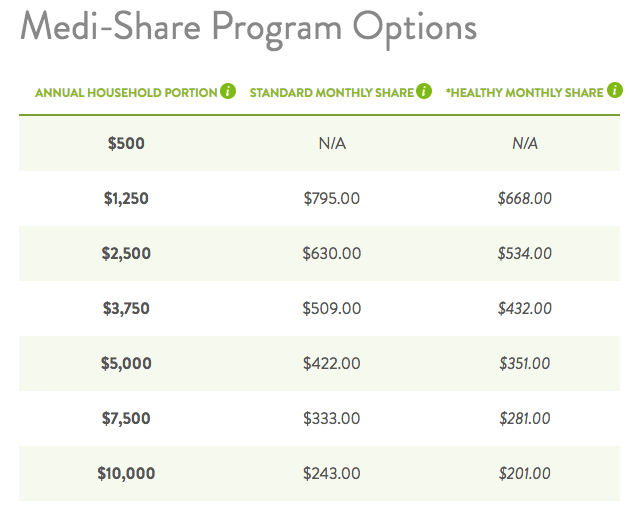 Medi-Share adjusts your monthly share cost each year based on the oldest member of your household. Below is a screenshot of what my own personal Annual Household Portion and standard monthly share (monthly insurance premium) would be in the program. Like traditional health insurance, healthier individuals and families pay a lower share amount that you see listed in the far right column of the table. Healthy monthly share is a term used by Medi-Share to describe the reduced monthly share or discount you can receive if you’re healthy. The healthy monthly share can be as much as 20% lower than the standard monthly share. Your household must meet the Health Incentive standards to qualify for the discounts. Like other insurance policies, things like waist measurement, body mass index, blood pressure, and other factors are used to determine your health and ultimately a discount on your monthly share. When you sign up for Medi-Share, there are a few one-time fees as well as an annual fee that you should be aware of before you join. Applicants pay a $50 application fee that is non-refundable when you initially sign up. And, new members also pay a $120 member fee during the first month of each year of their membership. You can start your Medi-Share plan during any month of the year, but the $120 is an annual fee that reoccurs on your anniversary month. Medi-Share holds the plan’s monthly shares from its members in an account with the America’s Christian Credit Union. There is also a one-time fee of $2 to set up your sharing account with America’s Christian Credit Union and a reoccurring monthly fee of $3 for account maintenance by the credit union. But, you can save $1 per month of that fee by signing up for electronic statements with the credit union. Additionally, there are restrictions for joining the program with preexisting conditions and while already pregnant. You can receive coverage for maternity expenses, but you have to be in the program before becoming pregnant. Also, like with most health insurance plans, there are restrictions for joining the program with certain preexisting medical conditions. Another large factor, both positive and potentially negative is that you have to be a Christian and live the Christian lifestyle to be a member and participate in the program. The program is based on biblical principles. While the savings through Medi-Share can greatly outweigh traditional health insurance, it won’t matter if you’re not a follower of Christ. Medi-Share will not cover you for what they consider to be un-Christian like behavior. They won’t provide coverage for illnesses and medical expenses that stem from or relate to things like drunk driving, extramarital affairs, unwanted pregnancies, and the like. You have to agree to live your life according to Medi-Share’s principles to join. You also have to be a Christian and attend a church regularly. So, is Medi-Share right for you and your family? Health insurance is not an easy topic to understand, and the costs are enormous. And, they seem to continue to rise every time we turn around. With Congress not inclined to change things anytime soon, it’s best to consider all of your options for health insurance and to share the cost of medical expenses. Medi-Share is a unique program for Christians to help bear the burden of rising medical costs while also sharing in a set of values that we hold dear. There are a lot of benefits and a few drawbacks to using Medi-Share to help defray your family’s healthcare costs. Medi-Share can provide Christians a significant amount of cost savings when compared to traditional healthcare insurance. While Medi-Share requires its members to abide by Christian principles, you can be sure that you are helping others and contributing to a cause with people of like mind and spirit as you as well as your family. [Editor’s note/update: I touched upon this in the first comment below, but wanted to add my thoughts up here as I know many people don’t read the comments. The “rules” by the health sharing ministries are the source of much of the angst about them. Many object to the fact that these organizations decide what is and isn’t “Christian”. I’m not going to get into that debate — that’s for each person to decide for themselves — but I do want to comment on the rules, what they result in, and why they allow for lower premiums. Now let’s consider a person who follows these rules compared to someone who follows none of them (or only a couple of them). The person who follows them is likely to be much healthier than the person who does not. And you know how generally healthier people should be rewarded? They should pay lower medical insurance premiums. Finally, if you need help getting into these categories or have a longer-term illness that needs help in being managed, Medi-Share has a “health partners” program designed to do that — to help you become healthier, get into the acceptable ranges, and end up paying less for your medical coverage. I wanted to go through the above to make this point: the rules/qualifications for health sharing ministries virtually guarantees that they have healthier members (on average) versus the general population. I do not know it for sure but my guess would be that this is one reason their premiums are lower — because their population is less expensive to cover. This is one reason we selected a health sharing ministry. We go to great strides to take care of ourselves and would prefer to pay rates in line with that reality, not be lumped into a program where we are paying more to help subsidize others’ poor habits. For instance, the thought that I’d have any of my money helping support someone who smokes is something I want no part of. I HATE smoking, have seen in my extended family what it does to people, and want no part of it. If you’re interested and would like more information, visit Medi-Share’s website. There they have a video describing how the program works, a bit about the company’s stability and history, and testimonials from members. Whether or not Medi-Share is for you is obviously a personal decision, but one worth considering among the various health care insurance options. My first question here is how successfully Medi-Share negotiates contracts with various providers, and whether this covers particular areas of the country, or all of them. The big, nationally known insurance companies negotiate contracts with most providers—hospitals, clinics, doctors—so that these facilities only bill a small portion of original cost to patients. To you. Without the contracts, people may be billed anywhere from three to ten times as much as those using contracts. This is true under both low-deductible and high-deductible plans. Many people don’t know this, of course. As a lifelong high-deductible patient, our family didn’t even bother submitting claims to our insurer. Then one time, our doctor’s office insisted on filing with the insurer. When our final bill came back, it was one/third of the original bill—even though our insurer paid not a penny, and we paid the balance. Before that, we always felt like we were wasting our health-insurance dollars. Afterward—even though we never, ever received a cent of reimbursement from our insurer, over more than 20 years—we realized that our $$$ had been well-spent. My writing skills are not the best. If what I’ve said hear is not clear, either about contract negotiations or about bills 1/3rd to 1/10th lower if your doctor/clinic/hospital files a claim for you before they bill you, please ask someone for clarification. If considering Medi-Share, my suggestion is to ask them first. Obviously, no one would select a service if it saved on premiums but then you had to pay three to ten times more for medical care. If you’re still unsure how they would handle it, that’s a great question for one of their representatives. I know for our health sharing ministry, we simply tell our doctors we are “cash pay” and we usually get a good discount. Medical providers are now catching on that it’s much less costly dealing with people who pay 1) immediately and 2) in cash and are beginning to pass those savings on to patients. Let me also so that if you are chronically ill (or know you have some issue that’s likely to occur), then a health sharing ministry is probably not for you. In fact, the mere presence of those items would likely disqualify you you from being accepted by one. IMO, a health sharing ministry like Medi-Share, Samaritan Ministries, etc. is designed to cater to people who are generally healthy (their rules virtually guarantee this). That’s one reason premiums are so low — because the pool is in pretty good health, especially compared to the general population. For that reason, my suggestion is that these ministries are best used by a healthy person/family who takes care of themselves, has occasional medical needs, and needs coverage just in case the unexpected happens. I would be very interested in the flip side. What happens when there is a catastrophic medical event with a person in the hospital and needing to be placed in rehab (Physical, Occupational, and Speech Therapies). My understanding from Social Workers is it is challenging for them to find rehab facility that will take someone with this type of insurance. Then there are also catastrophic medical events for people who live healthy lifestyles from Cancer treatments to very bad car accidents which can be just random bad luck of the life draw. Medical events are my 9-5 work world with me being one of the people that make the recommendations on where a patient needs to be discharged to so I am focused on having the best type of several insurances to have personally in order to have shot at quality care. I know firsthand from work environment the places people have to go to otherwise. This is a good question as well. 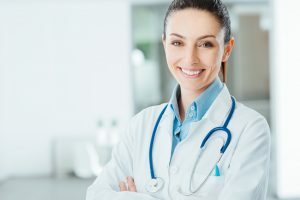 Instead of answering every question someone has on this post (I’m not a medical advisor, after all), my suggestion is to 1) visit their FAQs page (which covers questions like this), 2) request additional information from them, and 3) call them up and ask them specifically to address the questions you have. That’s what we did when we selected a health sharing ministry — we did a lot of research. I suggest you do the same. IMO, it’s worth going through this process as the costs are so different. Just like you would with any other purchase, do some comparison shopping. Ask the questions. Do the research. Then decide what works for you. My guess is that any question asked on this post will have been asked by hundreds (thousands?) of others as they consider their options as well, and for some reason, 300k people have selected to go with Medi-Share. Somehow they got past all the questions and decided to join. I understand that a health sharing ministry is 1) a newer concept and 2) different from the norm. I also understand it’s not for everyone. In fact, I’d say at this point in time, it’s probably not for most people. But as I said above, finding health coverage (especially in early retirement) is still a HUGE question I get almost every week, and this could be a solution for many having that question. We talk every day on this site about making different choices than the pack. We talk about what we are doing to become financially independent and retire early. Most people are not willing to make or even consider those. So why wouldn’t we apply the same principle of going against the pack when considering medical insurance? I’m not saying you have to decide to go with a health sharing ministry, but isn’t it prudent to at least look into it? Finally, it does not matter to me what anyone selects for their medical coverage. As I said at the top, I think this could be a good solution for some, as it has been for us, and I wanted to share it with everyone for consideration. People outside the medical and insurance fields are surprisingly under-informed about many aspects of the field. Many of us operate as if we will somehow know when we’re going to really need insurance — a “catastrophic event”—and get the right, necessary form of insurance just before then. I’m disappointed by the hands-off posting of this shortsighted Medi-Share review here. Our society is rife with the kind of flattery that encourages each of us to consider selves “above average.” Few areas where this matters more than in the sadly inadequate field of healthcare insurance. I appreciate Debbie’s brief comment here. Wish I could be so succinct! First of all, this is meant to be an introduction to a topic, not a comprehensive review. It’s meant to open up a topic for consideration that many do not know about. from there, people can consider what appropriate next steps work best for them. Second, by pure stats, 49.9% of the people are “above average” for any given measure, so we’re not talking about an insignificant number of people. Third, after 12+ years of blogging over two sites, my experience is that when someone comments for the first time on a regular post and that comment is 1) very negative, 2) ignores much of what has been said in the post and the comments, and 3) puts up straw man arguments like paying 3-10x for medical service without an insurance company, then they likely have some sort of ax to grind — whether it’s because they work for the insurance industry, have a specific political point of view they want to advance, or simply don’t want to consider new alternatives. Looking at your comments above, you could fall into all of those categories. Fourth, what is not speculation is that there is massive savings in premium costs between health sharing ministries and most (all?) plans under the ACA. I detailed my specific ones in the previous post I did (these are FACTS, actual quotes from sites/companies, not speculation). This is most likely due to the populations of health sharing ministries being healthier than average, as noted above. One approach given this cost difference is similar to the philosophy of “buy term and invest the difference.” A person could join a ministry like Medi-Share while also saving/investing the difference between it’s premiums and ones from an ACA plan. This excess could be used to cover expenses over time (if needed) and if not needed, then kept for yourself. Fifth, buying insurance is a personal decision with many factors. Do you want to insure against every possible outcome? That’s fine, but your costs are going to be higher. Are you willing to take a small amount of risk that’s unlikely to happen? If so, then your costs will be lower. Everyone needs to decide for themselves and that’s why I’m opening up this idea — to give more people the option to consider. Is there really something wrong with that? Finally, buying insurance needs to be part of an overall financial plan, not just done in isolation. There are a ga-zillion factors to be considered and everyone has to take their own special circumstances into account before deciding what is right for them. There are tons of people reading this right now who might view a health sharing ministry as a viable answer to their insurance needs (like me). Please try to let them investigate the possibilities and research the best options themselves without fear-mongering. Is there a maximum that these sharing ministries will cover either in a year or lifetime? As noted above, I’m not an expert in this area. My intention is to introduce the concept and let people who are interested in more information begin doing their own research. If your question is not answered there, I suggest you contact Medi-Share directly through their site or by phone. It depends on the ministry. Medi-Share has no limit. Samaritan Ministries does, though you can increase the limit by making a higher payment each month. However, they have no unlimited option, which was one major reason I went with Medi-Share; I have a cousin who ran up huge bills battling breast cancer, and the daughter of a friend has had both a heart and a kidney transplant, so a limit like $125,000/year seems very dangerous to me. To my mind, the greatest value of insurance is for catastrophic events, not the everyday stuff that I can plan and save for. While Medi-Share “isn’t insurance,” it functions basically the same as insurance in my life. I’ve used it for a year, and haven’t reached submitting a bill for sharing yet, but I’m literally saving 75% off what an Obamacare policy would have cost me, so that way more than covers the preventive services Medi-Share doesn’t. As previously mentioned, these are additional reasons the coverage is relatively affordable. I think it’s a great program and thanks for sharing, ESI. I read through the FAQ’s and it an interesting program. Did you get the sense on how often one is supposed to be attending church to be eligible? The FAQs say “regularly”. The specifics would need to be answered by them. This point was specifically what I was pointing to. Our lengthy experience was the opposite. We were greatly surprised. Maybe ESI and its reviewer are correct, and “Medical providers are now catching on…” That would be great. It certainly has taken them a long time. A number of aspects of healthcare and insurance fly under the general radar. I pointed to one basic aspect that we learned late in the course of our medical histories—and surprised us, given that we do work peripheral to the healthcare-insurance industry. Debbie’s point struck me as a cogent one also to bring, early on, to the discussion. From the reading of the whole, I’d say it is neither she nor I who have the axe to grind here. Other than the one that motivates this site: to bring fresh insight to financial matters that many of us don’t know about. In my follow-up post, I asserted that one from our host had disappeared. This was not the case. Whatever happened with my browser and this thread of comments, the relevant post does still appear. My bad. For which I apologize. I have recently signed up with Medi-share after considerable research into Medi-share, Liberty, Samaritan, and Christian Healthcare Ministries. I have no experience yet as we just signed up and won’t start coverage until the new year. I do have some numbers that may be of interest to people though in thinking through some of these choices. It is true that insurance providers do buy down the rates. As to the 3-10 numbers quoted above though those appear to be excessively high. I notice he mentioned at the end that the insurer was Medicare. Medicare rates are excessively low. For example Liberty Health Share will pay bills at 150-170% of Medicare rates. No private insurance company gets Medicare rates. NONE. If they did the hospitals would all be out of business. Medicare rates are money losing rates. The rest of the health care market subsidizes Medicare rates. I currently have COBRA insurance from my former employer whom I left about a year ago. It is spectacular insurance. It pays for things that many other insurance plans we know people have don’t pay for. I went back through the past 2 years of bills and compared what was billed to what was actually charged after insurance negotiated rates were used to buy down the cost. In most cases the rates were reduced ranging from about 10% to 70%. The most common reduction was in the 30-40% range so in that case a $100 bill got reduced by about 1/3 to $65. Once in a while it got reduced 2/3 to about $35. Never did it get reduced 90% to $10. Now with Medi-share they are a member of the PHCS PPO network. With that network Medi-share is working with the medical providers to pay your bills and to buy them down via the pre-negotiated rates of that PPO network. How good is that network? As with any network it is going to be a limiting factor. I checked and every hospital within 30 miles that we would use is in the network and probably about 1/3 to 1/2 of the doctors we might want to use are. So for doctors we see it might be a bit limiting. You don’t have to stay in network but you would not get pre-negotiated rates and would have to work on discounts yourself then and medi-share may only reimburse for amounts that meet the customary and reasonable amounts used by other insurance type agencies. Those are choices you would make. It’s also worth noting that the procedure mentioned above was a colonoscopy. Almost none of the medical sharing ministries pay for routine procedures. They do not pay for check-ups, physicals, routine examinations, mammograms, colonoscopies, etc. These are consider health maintenance and are not things the medical sharing ministries share in. You manage and pay for your health screenings yourself. (It is worth noting that Liberty does appear to pay for some routine screenings, none of the others appear to.) Some people consider this a major gap in this kind of coverage. But it is all explained in the guidelines and you just have to know what you are signing up for. Medical sharing is designed to share costs from accidents, disease, and injury. They are not designed to share costs for routine care or for chronic conditions. For example they are not going to pay for your diabetes shots for the next 20 years and they are not going to pay for treatment drugs to deal with chronic on going pain from rheumatoid arthritis or something like that for the next 20 years. Some people consider this a major gap as well. And for some it might be. Again, you have to know what you are signing up for and be ok with it. The real key to understanding this is to understand that when you ask for a product that pays for everything like that you have to pay in enough premiums to cover all those costs for all the other people who are using the insurance regular to get those kinds of services. And you are generally paying for people who tend to be on average sicker as well. The two of those things drives up costs considerably. So to that point lets get to some numbers. Annual Family Deductible : $3,000. Percent paid after deductible : 90%. Premium: $1,350 per month (this includes a 2% administrative fee that companies are allowed to charge when a former employee uses COBRA to retain their previous insurance). Max Annual possible costs with premium and out of pocket = $21,000 if you have $23,000 of medical bills. As you can see even though this insurance pays pretty quickly and has a low max out of pocket it is still not exactly cheap. It costs $16,000 per year. That’s a lot of money but it pays for literally everything and doesn’t leave many costs to us. But that being said I don’t want to keep paying that premium. I need to make a change. Since I live in MN I have the option of going on the MN ACA exchange known as MN Sure to purchase an ACA compliant policy. What do those policy numbers look like. There are actually a number of options on the MN exchange but they are all very similar so I am just going to show one example policy (From the same insurance company that provides the COBRA insurance I am currently on but I can’t purchase a policy remotely as good as the one I have from my employer via COBRA). Annual per member Deductible : $6,000. Annual per family Deductible: $12,000. Percent insurance pays after deductible : 20%. Member max out of pocket: $6,650. Family max out of pocket: $13,300. Max Annual possible costs with premium and out of pocket = $29,300 if you have $13,625 of medical bills spread across two people. For the record the silver policy lowers the deductible to $4,000 for family but still has max out of pocket at $13,000 and only pays 40% of the costs beyond the deductible and increases the premium to $1,514 for that so you are up over $18,000 for premiums in that case. You could actually face max costs in that case of over $31,000. These are astronomical numbers to potentially face and be considered insured. You are facing $20-30K in medical costs annually almost no matter what happens. Calling that affordable coverage seems to me to be insulting. Now if you are low income you will be subsidized perhaps at 100% and then it becomes more affordable. But if you find yourself solidly in the middle class it suddenly becomes unaffordable. Co-Pay : $35 (medi-share has a $35 co-pay that isn’t shared by the plan). Monthly premium: $250-300 depending if we qualify for the healthy discount which we don’t know yet. We are both 47 and rates do go up slightly as you age on Medi-share. Max annual costs = about $13-14,000 with a few co-pays if we have $10,000 of medical costs. The truth is that medical care is expensive. Insurance for it is even more expensive. Unless you are getting a subsidy for that insurance, its hard to justify premiums that are 4 times higher with max out of pocket costs that are 2 times higher based on the numbers I presented above. As far as how we chose Medi-Share. It was close between Medi-share and Liberty. I really wanted to choose Liberty, but it is considerably smaller than Medi-share without as strong a track record and it had a few things in their guidelines that I didn’t like the language very well as it seemed a little too vague to me, but that was just my interpretation. I may still consider switching to them in the future, but for now we decided to go with Medi-Share. The only thing that was certain was that we could not afford to buy ACA compliant insurance. One other thing, and this may also rub a number of people the wrong way, but if you were to ever develop something that was chronic and was an ongoing issue for a medical sharing ministry you could always signup for an ACA plan during the next open enrollment period. Some people say that is gaming the system, and they may be right. But the fact is that the system is what it is. I didn’t create it, the government did. It is unaffordable for me to participate in it while I am healthy, so I opt out. The fact that they let me come back in later, when I may be less healthy is a fact that they specially wanted, and is a benefit to everyone including those of us who had previously opted out. Thank you for such deep details. It’s now been a year since you chose medi share.. how’s it been working for you. My cobra ends in Feb 19 and I’m looking for similiar sharing plan. I get email notifications of follow-up comments here, but for some reason, they don’t show up in my thread. I got one from “Alex,” that I can’t find or read or respond to directly. So I have to do it here, with regrets and apologies. In this key regard, my own concern has been answered, and well and clearly. I obviously made a false assumption in reading the original review: that Medi-Share negotiated no agreements with providers. I apologize for that too-frequent error of judgment. In terms of “ax to grind,” yes, my assumption shows this to be true. We live in a country that overwhelmingly evaluates healthcare insurance on the basis of how healthy we are and how little healthcare services we have used to date. I read blogs such as ESI’s in particular hopes of finding better-grounded alternatives to such common misconceptions. Aspects of the original review raised my “antennae” in regard to this topic. I was disappointed in what I read, seeing it as encouraging that common misunderstanding. I was mostly mistaken in this appraisal. 1. Be sure your browser cache is cleared. You probably did this already but you would be surprised at how it’s often the answer when people have these issues. 2. When you get an email notice that a comment has been posted, there’s a URL given for that specific comment. Click on that and it should take you right to the comment. Meeting with a financial planner to buy health insurance is an option, although many use insurance agents that provide the comparisons of costs versus plans versus benefits and usage. I think it is great that the Ministry plans have been offered as an option for others to investigate. I know some young people on the Ministry plans and they have had an excellent experiences. Shopping for insurance has become so costly with increasingly limited benefits and limited provider choices as networks continue to get skinny. In our area if a doctor sees a patient with a high deductible they often are making the patient pay part or all of the high deductible before they will see that patient. Also may people now have stopped going to doctors because even though they have insurance they cannot afford the high deductibles and copays and out of pockets so once again, they have insurance but limited access to medical insurance. We are going in a circle with medical insurance and now even the middle class is getting squeezed. The Ministry plans do not have to play by all the rules/regs as Obamacare/ACA plans so they don’t have to offer all the services. Cheaper that way. But with that said they don’t really qualify as having insurance so at some point the IRS can determine to penalize them for not have insurance. So far that has not happened. Buying insurance is like grocery shopping or car buying. You can go to either Krogers or Aldis. You can buy a Toyota Corolla or a Mercedes. I am glad in medical insurance you have those choices and this blog has pointed that out. Concierge plans have been a big new hit in my area. For those that can afford it. Also many just refused to buy insurance and are “self insuring” and willing to pay the cheaper penalty. Buy stocks or stuff your $ in a mattress–you could win either way. If market drops you lost nothing with the mattress. However if market continues upward you gain a lot. Same with insurance. I know many people that never bought insurance and have amassed a savings account with hundreds of thousands of dollars in it “just in case”. I know others that have paid $24,000 a year for insurance they never used, and others that had a huge catistropic health issue where $24,000 a year was a drop in the bucket compared to what the insurance company paid out for claims. Are you a risk taker or not, are you healthy or not, do you have a big savings account or not. Aren’t you glad you have the options available? I am grateful for the disclosure of the relatively new Ministry plans. Everyone learns their health insurance plan/benefits one claim at a time. Same as grocery shopping, you learn what stores have the good bargains, what stores sell outdated food, what stores have a good choice of organic, what stores have long lines, and all that helps you determine where you will shop. All about choices and options. It sometimes takes a great deal of time to investigate to be a good consumer. Same with medical insurance. Thanks for providing the info on the Ministry plans. Actually the IRS cannot choose to just start penalizing people on sharing ministries. The ACA has a specific exemption written write into the law that says anyone who is a member of a sharing ministry that was in existence prior to 1999 is not subject to the penalties of not having an ACA compliant plan. Before the IRS could start penalizing those on sharing ministries there would need to be an act of Congress that changed the ACA law to remove that exemption. I don’t understand why it has to be Christian based. My guess is that it got its exemption to the ACA because it is “Christian” based. Not for sure, that’s a pure guess. I put “Christian” in quotes because some of the conditions are tied to Christianity (church attendance, profession of faith, etc.) but others are neutral — not Christian or Christian per se. For example, smoking (which I do not believe is addressed in the Bible — willing to be corrected here) is a “no” at Medi-Share. Personally, I don’t think smoking is un-Christian, it’s just a bad health choice. These are likely Christian because Christian groups are the ones who decided they wanted an alternative to traditional insurance. These were all setup far before the ACA so it wasn’t a response to that law. Insurance was already getting expensive long before the ACA and these groups thought they could set up a model based on sharing and living guidelines they believed would lower costs. They believed a Biblical model of living and the lifestyle choices of those who profess to follow Christian principles would result in healthier living and lower costs. That may or may not be true but that is what the organizations who originally set these up believed. Any non-profit group could have set up their own non-Christian based sharing group. Apparently none did. Only the Christian groups decided to do this so those are the only options available. Because these groups already existed, had been operating for 15+ years at the time of the ACA and had hundreds of thousands of people who were using them, they lobbied Congress hard and were able to receive a carve out exemption in the ACA. From my understanding Congress didn’t want to put the exemption in but it was probably part of some deal making and so the carve out was made as restrictive as possible. As such the exemption only applies to those sharing ministries that already existed prior to 1999. No new groups can be created and receive the ACA exemption unless they are somehow tied to one of the sharing ministries that already existed in 1999 and those are all Christian. That’s your government at work. This exemption was given grudgingly and they have no interest in supporting any more of these than they have to. There is no other explanation for such a goofy exemption that is tied to an organization having existed more than 10 years prior to the passing of the ACA. There is an easy fix though. If Congress repeals the individual mandate then insurance companies could provide any kind of insurance they want and people could buy it without facing a penalty. Any kind of sharing group could be created. The free market could create any kind of insurance / sharing / health payment plans that people wanted and people could choose what they thought was best because there would be no penalty for not choosing what the government told you was best. That’s the fix. But as long as the individual mandate requires people to buy government approved insurance or pay a hefty fine then this is the convoluted system we will have. And it’s why those of us who can are opting out. Isn’t Medi-share the most restrictive of the ministries? I.e. if you are out of their “healthy” guide lines not only do you pay more per month, but must also participate in their health coaching plan, and if you are not making sufficient progress (as decided by them) you’re kicked out. I don’t know if they are the most restrictive or not, but they do have requirements and if you feel you can’t meet/maintain/get to them then the service is probably not for you. Other ministries have the similar programs. For example Liberty has HealthTrac which is a health coaching program you need to be on if you do not meet their health standards. I am not as familar with what Samaritan and Christian Healthcare Ministries do in that respect. Does anyone have experience with how quickly Medishare pays the providers? I’ve read some reviews that members were pursued by collection agencies and Medishare took quite a long time to play the bills.